The Simpsons MAC collection has hit the stores today having been available since the 28th of August online. This small collaboration celebrates The Simpsons 25th Anniversary and is limited edition, available until the 2nd of October. 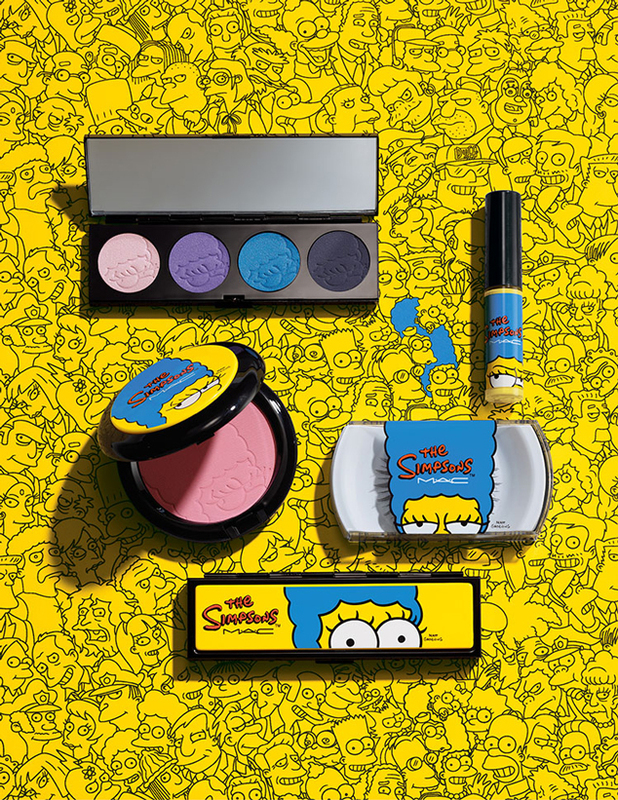 The collection features 10 Marge inspired pieces, from nail stickers, lipglass, blushers, lashes and eyeshadow palettes. The electric colour collection has definitely taken reference from the Springfield inhabitants with fun and off the wall combinations. Following M.A.C’s prior collaborations with fictional characters (Miss Piggy and Maleficent) this is maybe the most iconic and eye catching. In The Simpsons MAC collection there are 2 different quad palettes, the ‘That Trillion Dollar Look Quad‘ and ‘Marge’s Extra Ingredients Quad‘. That Trillion Dollar Look Quad will give a bold eye with yellow and lime green shades through to browns and blacks whilst Marge’s Extra Ingredients Quad features loud electric blues, violets and baby pinks. Also for the eyes in the collection are The Simpsons 7 Lash, designed to be a natural length to achieve everyday glamour. For the cheeks there is a selection of 2 different powder blush, Pink Sprinkles – Cute Blue Pink and Sideshow You – Light Peach Coral. Finishing up the collection are the very yellow set of 16 nail stickers. I look forward to trying these bold and vibrant colour combinations with the quality that comes with M.A.C. I wish that there was a little more merchandise such as lipsticks, brushes or mirrors but the limited edition packaging is Eeeeexcellent.